Q: How many direct flights from Beijing to Shanghai are available every day? A: In one day, there are around 50 direct flights to Shanghai taking off from Beijing. Q: How long is the distance of Shanghai to Beijing flights? A: The flying distance of the Shanghai - Beijing flight is 1,160 km (721 mi). 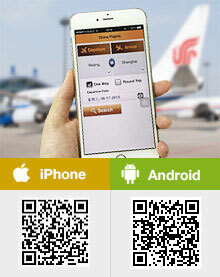 Q: What is the flight time of Beijing to Shanghai flights? A: The flights from Beijing (PEK) to Shanghai Pudong (PVG) and Shanghai Hongqiao (SHA) both take about 2 - 2.5 hours. Q: What is the price for the flights from Shanghai to Beijing? A: The full price of the economy class ticket of the Shanghai Pudong (PVG) to Beijing (PEK) flights is CNY 1,490. In China, the low season of travelling is usually from November to next March and the high season is usually from April to October. Normally, domestic flights have a 30% - 60% off discount in low season and a 20% - 40% off discount in high season. There is usually no discount for air ticket in public holiday. Q: How to find cheap flights from Shanghai (SHA) to Beijing (BJS)? A: If you want to buy cheap flights from Shanghai to Beijing or from Beijing to shanghai, you can book the ticket from low cost airlines, like Spring Airlines; but pay special attention to the luggage allowance. The luggage allowance of the low cost airlines is usually very small and the charge for excess luggage is really high. From the table we can see that the costs of traveling by high speed train is relatively lower, while flight has an advantage in travel time. So flight is recommended to passengers in a hurry while high speed trains are preferred by those who want to save some money. If we would like to go Disney shanghai, it’s better by high speed train or flight from Beijing? Both are available. It may cost more by plane but the travel time will be less. If you choose to take a high speed train, it costs less. There is no train available in beijing airport. You may choose taxi, airport shuttle bus or subways to transfer to Beijing South Railway Station and then go for Danyang by high speed rail. The ticket price is USD73 for second class seat. How much baggage am I allowed on the flight? I am looking to book a flight for me and my husband from Beijing to Shanghai and I am worried about the baggage allowance. I know different airlines will allow different allowances but when looking at China Eastern Airlines it doesn't seem to mention domestic flights from one part of the country to the other, it just mentions travelling to the US or Dubai etc. Do you know what the restrictions are with domestic in country flights? The domestic flight are all 20kg per person for Eastern Airlines. Departure city is Beijing? You could search the airfare on the page and choose your preferred one by submitting an online booking. So far as I know, the ticket price on the web is live updated.